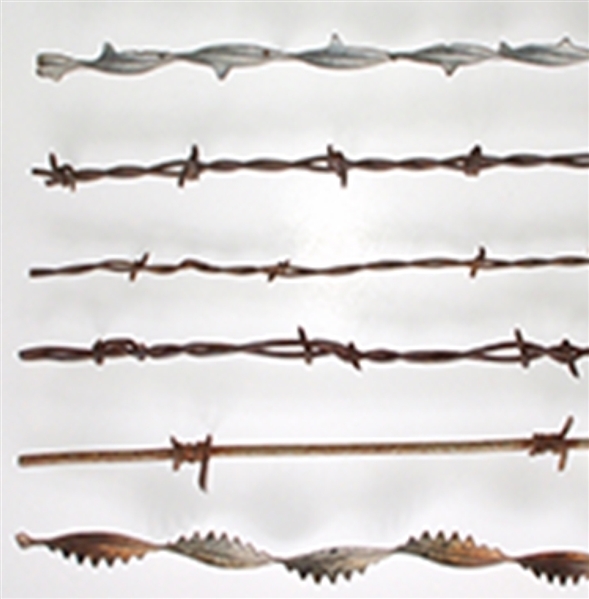 A collection of 50 different varieties of antique barbed wire, each piece measuring about 20” and each has a paper label identification. Of the 50 examples, we will list six as representative to include; Merrill medium gage, “Buffalo Wire” 1876; Brotherton, common 1878; Nadelhaffer “crossover ‘N Barb” 1883; Allis “Buck thorn, 1881; Ells small Sawtooth 1885; and Curtis 1/2 Twist 1/2 Barb, 1892. The first patent in the United States for barbed wire was issued in 1867 to Lucien B. Smith of Kent, Ohio, who is regarded as the inventor. Joseph F. Glidden of DeKalb, Illinois, received a patent for the modern invention in 1874 after he made his own modifications to previous versions. Barbed wire was the first wire technology capable of restraining cattle.